Read the Overview Now Order It! Order It Online Now ! 2009 KROHNE introduces ALTOSONIC V-12, which is designed for custody transfer gas flow measurement. The V-12 has 12 chords. May 2011 Elster introduces the Q.Sonic Plus Ultrasonic Flowmeter at the American Gas Association (AGA) Conference in Nashville, TN. The Q.Sonic Plus has six paths and 16 chords. Titan Enterprises, which is based in the United Kingdom, unveiled a new ultrasonic flowmeter in April 2010. Called the Atrato, it is especially effective on low flows. In April 2010, Siemens released the FUT1010, a new ultrasonic flowmeter for the hydrocarbon industry. It is available for both gases and hydrocarbon liquids. GE Sensing announced the release of the Sentinel LCT and the Sentinel LNG in August 2009. The Sentinel LCT is designed for custody transfer of crude oil and refined products. The Sentinel LNG measures Liquefied Natural Gas. In September 2008, Blue-White Industries began shipping its new clamp-on Sonic-Pro® ultrasonic flowmeters. Previously, the only type of flowmeter manufactured by Blue-White was variable area. The Sonic-Pro is a hybrid flowmeter that is selectable between transit time and Doppler technologies. In August 2008, Siemens announced the release of a new SITRANS F US standalone thickness gauge. This gauge measures the wall thickness of any metallic of non-metallic pipe, which is a crucial measurement for clamp-on ultrasonic flowmeters. The output form the F US thickness gauge is entered into a flow computer, and is used in calculating flowrate. In April 2008 at Interkama in Germany, KROHNE released a new series of ultrasonic gas flowmeters for non-custody transfer applications. The OPTISONIC V6 was developed for applications in the production of natural gas and for gas suppliers' city gates and transfer stations. It can also be used in offshore platforms. The OPTISONIC Vs is a six-path flowmeter. IDEX Corp. purchased ADS LLC in January 2008, including its ultrasonic division. The Accusonic line includes multipath ultrasonic flowmeters for hydroelectric penstocks, and large pipe and channel systems for cooling water and condenser water lines. 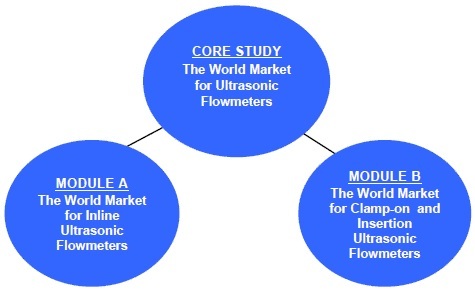 Many changes have occurred in the ultrasonic flowmeter market since the 2nd edition of this study was published in March 2003. At the ISA show in October 2007, GE Sensing introduced its PanaFlowTM ISX, the newest portion of GE’s ultrasonic line-up. These devices are designed for applications in the oil & gas, power generation, and water industries, and in a wide variety of liquids including chemicals, solvents, weak acids, water, petroleum products, lubricating oils, and hydrocarbons. The firm claims that the compact design makes it easier, and thus less costly, to install in hazardous locations. Bidirectional flows can be measured in pipe sizes ranging from 4-24 inches, with a stated accuracy of ±0.5%. Power is via 2-wire loop. Controlotron. During this period, Controlotron maintained its focus on the clamp-on transit time ultrasonic flowmeter market. The most significant event of this period for Controlotron was its sale to Siemens in May 2006. The company has been renamed Siemens Energy & Automation Process Instrumentation Business Unit. Instromet. Instromet expanded its Q-Sonic 3 and Q-Sonic 4 models, both of which are used for custody transfer of natural gas. These improvements include relocating the transducers to the upper side of the meter, and introducing a Coded Multiple Burst (CMD) signal that improves meter performance in hostile situations. KROHNE. While KROHNE has not traditionally expanded its product line through acquisition, the company was very active in introducing new products during this period. In August 2003, KROHNE brought out the Altosonic III, a 3-path meter designed for liquid applications. The Altonsonic III is a cousin of the Altosonic V, which is designed for custody transfer of liquids. Early in 2004, KROHNE formed an alliance with SICK, allowing it to bring out the Altosonic IV, a meter designed for gas applications. The Altosonic IV is a version of the SICK MAIHAK ultrasonic flowmeter. KROHNE was also very active in the Coriolis and magnetic flowmeter markets during this time. Emerson Process Management. Emerson Process’ ultrasonic flowmeters are part of the Daniel division. Emerson Process is a leading supplier of ultrasonic flowmeters for custody transfer of natural gas. In November 2004, Emerson Process announced a series of upgrades to its line of SeniorSonic and JuniorSonic ultrasonic flowmeters for gas flow measurement. The upgrades include the capability of acquiring live gas composition data from a gas chromatograph and the real-time calculation of speed of sound. In June 2006, Emerson Process launched the Model 3804, a liquid ultrasonic meter designed for fiscal metering applications. Siemens. Siemens first introduced its ultrasonic flowmeter, the FUS, in 1997. In September 2003, it acquired the flow division of Danfoss, including Danfoss’ series of SONOFLO ultrasonic flowmeters. Then in May 2006, Siemens completed the acquisition of Controlotron, a leading supplier of ultrasonic clamp-on flowmeters. Siemens is now selling all these flowmeters, including the Controlotron meters, as part of its F US Series of ultrasonic flowmeters. Other companies. The acquisition of Caldon by Cameron Measurement Systems is very significant. Cameron is one of the world’s leading suppliers of valves, and a major supplier to the oil & gas industry. It is also significant that Sierra Instruments and George Fischer have entered the ultrasonic flowmeter market. Because the ultrasonic flowmeter market is growing so rapidly, more new suppliers can be expected to enter this market.